Last week the world mourned for the 1986 explosion of the Challenger space shuttle that claimed seven lives. Today, we mark the 13th anniversary of Space Shuttle Orbiter Columbia’s breakup upon reentry into Earth’s atmosphere. The Columbia disaster was a very bad day for America’s space program. Yet one of STS-107's crew sent an email message shortly before meeting their demise that profoundly puts everything into perspective. Mission Specialist David “Doc” Brown was a ridiculously accomplished naval aviator who also became a flight surgeon and eventually an astronaut. The letter below was sent by Doc not long before Columbia began her doomed reentry flight profile. It’s hard to believe but I’m coming up on 16 days in space and we land tomorrow. Floating is great – at two weeks it really started to become natural. I move much more slowly as there really isn’t a hurry. If you go to fast then stopping can be quite awkward. At first, we were still handing each other things, but now we pass them with just a little push. We lose stuff all the time. I’m kind of prone to this on Earth, but it’s much worse here as I can now put things on the walls and ceiling too. It’s hard to remember that you have to look everywhere when you lose something, not just down. The views of the Earth are really beautiful. If you’ve ever seen a space IMAX movie that’s really what it looks like. What really amazes me is to see large geographic features with my own eyes. Today, I saw all of Northern Libya, the Sinai Peninsula, the whole country of Israel, and then the Red Sea. I wish I’d had more time just to sit and look out the window with a map but our science program kept us very busy in the lab most of the time. The science has been great and we’ve accomplished a lot. I could write more but about it but that would take hours. My crewmates are like my family – it will be hard to leave them after being so close for 2 1/2 years. My most moving moment was reading a letter Ilan brought from a Holocaust survivor talking about his seven-year old daughter who did not survive. I was stunned such a beautiful planet could harbor such bad things. It makes me want to enjoy every bit of the Earth for how great it really is. I will make one more observation – if I’d been born in space I know I would desire to visit the beautiful Earth more than I’ve ever yearned to visit to space. It is a wonderful planet. Astronauts are consistently among the finest humans on our planet—that’s why they are allowed to leave it from time to time. 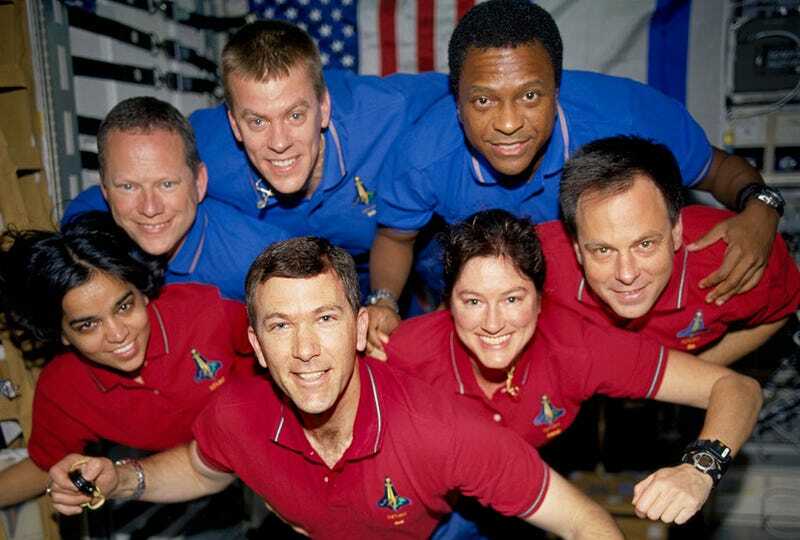 Columbia’s crew included Mission Specialist Kalpana Chawla, Commander Rick Husband, Mission Specialists Laurel Clark and David Brown, Pilot Willie McCool, Payload Specialist Ilan Ramon and Payload Commander Michael Anderson. With all the bad news out there that highlights the worst examples of humanity, once in a while it is nice to celebrate and remember those who exemplified the best of us.